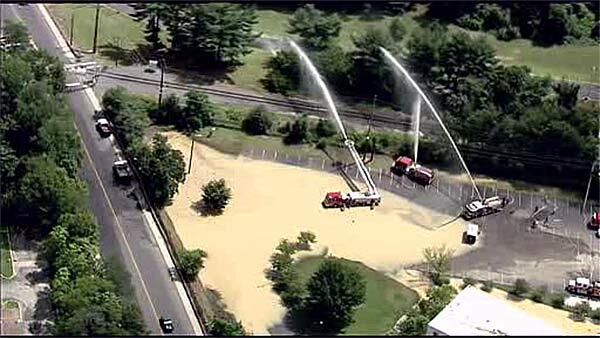 GLASSBORO, N.J. -- Heavy overnight downpours flooded a housing complex at Rowan University in Glassboro, N.J.
A university spokesman told Action News the basement of the Triad Apartments building had to be pumped out by firefighters. Video from Chopper 6 HD showed a large section of the parking lot outside the complex covered in water. Two fire engines were seen pumping the water out of the lot and spraying it via fire hoses to another area with better drainage. Rowan says only eight people were living in the large complex this summer. They have been relocated because of the flooding. There was no immediate word on the extent of damage caused.